My fountain pen education thus far has primarily focused around pens from two countries of origin: Germany and Japan. That seems like a narrow focus, but considering the production history and love of writing those two countries have, focusing on one brand from one country could give you more than enough choice to last you a lifetime. As I learn more about this wonderful industry and hobby I am realizing that a third country belongs in the conversation: Italy. I own two Italian pens, and brands like Omas, Visconti, Aurora, Delta, and Montegrappa - to name a few - are well known and respected by fountain pen lovers young and old. But it's only been recently that I have had more than a superficial interest in Italian pens, and I am quickly learning what I have been missing out on all these years. The opportunity to use the Omas Milord Arte Italiana ART recently has opened my eyes to the wonderful work being done by Italian manufacturers. 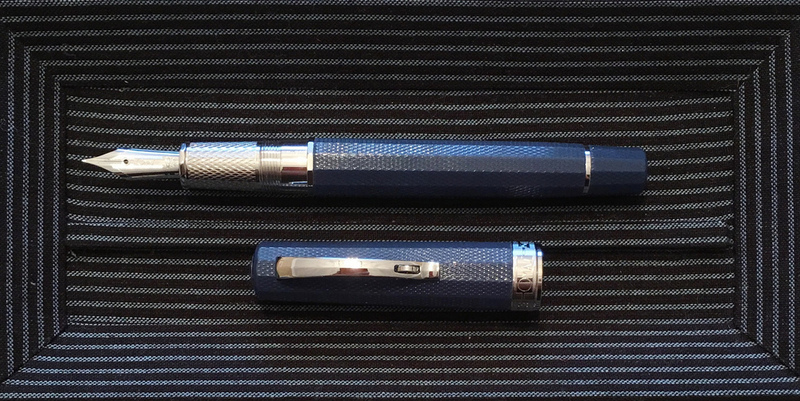 I own a Visconti, and even own an Omas, but until using this Arte Italiana ART I didn't "get it". Well, needless to say, I get it now. Let me be clear about something right upfront with the ART: this is a high end luxury pen, and a limited run of 311 units in this color. Street price runs around $680, which makes it the second most expensive pen I have reviewed (my Nakaya Portable being the first). I get asked all the time about expensive pens and their relative worth compared to more reasonably priced options. The majority of the time, you can get a comparable writing experience with a lower priced option, and the price difference lies in unique design or rare materials used to make the pen. Other times, the overall experience is so exceptional that the price is justified comparatively. This is one of those times. In talking about this particular Omas I'm going to make a bold statement up front because I feel this strongly about it: This is the best gold nib I have ever used. It's truly fascinating. The fine 18k nib is unbelievably smooth and hits a sweet spot right between firm and springy. For a non-squared off nib (like a stub or italic), the edges of the lines on the page are surprisingly crisp and sharp. I get nibs modified often because I like that clean look and this one I wouldn't consider touching. Speaking of flawless, this barrel is something else. The guilloche pattern in the Teal Green cotton resin barrel is subtle, but as a whole unit it draws your eyes in and won't let them go. It feels wonderful too, with just the slightest tactile touch to let you know it's there. Writing balance is impeccable, and the overall feel when doing its job is spot on. Part of that balance is due to the Rhodium plated grip section. The weight of the metal offsets the lightness of the cotton resin barrel. It is comfortable to hold and not slippery at all. It also continues the guilloche pattern seen on the barrel. Rhodium plays a design role throughout the ART, bringing together the nib, section, clip, cap band, finial, and piston ring. The piston filling system itself twists fluidly from the end of the pen and fills up the barrel with ease. I didn't measure the ink drawn in but it reports to have a 1.2 ml capacity. Judging by the ink in the bottle of Omas Turquoise and my lengthy writing time, I have no reason to doubt that. I received this pen on loan from Kenro Industries for review and I'm going to have a tough time sending it back. I've been using it constantly for the past couple of months, and just yesterday was the first time it sat on my desk uninked. The 2016 fountain pen show season kicks off soon though, and a cotton resin barrel Omas will be at, or near, the top of my shopping list. 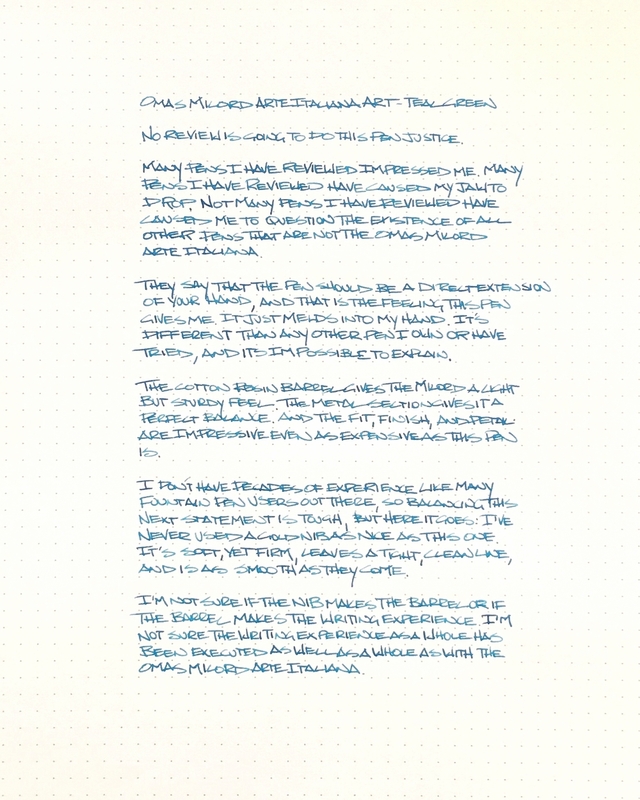 Posted on December 7, 2015 by Brad Dowdy and filed under Fountain Pens, Omas, Pen Reviews.